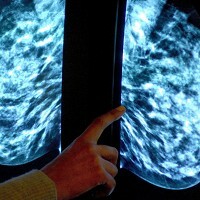 Women could be offered a blood test in the future that warns if they are at greater risk of developing breast cancer. The simple test could be created after "promising" research by scientists at University College London, who discovered a molecular 'switch' that can raise the possibility of a woman developing a non-inherited form of the disease. The researchers found a marker associated with women with the BRCA1 breast cancer gene - which massively increases the risk of developing the disease - was also present in women without the hereditary gene. Women with the BRCA1 or BRCA2 mutation sometimes opt to have a double mastectomy, with one of the most famous examples being Angelina Jolie. The Hollywood film star took the drastic option in order to reduce her chances of developing breast cancer. However, there is currently no way of reliably predicting which women are likely to develop a non-inherited form of the disease, and scientists believe it is these women who will benefit from the new blood test. The knowledge provided by the blood test would allow women to decide how best to proceed in terms of reducing the risk of getting breast cancer. Of course there is still the chance that breast cancer could develop, and that leads to further difficult choices for women, including how to live with the disease. As well as the health effects, there are practical problems to overcome in order to carry on leading as normal a life as possible, including when enjoying a holiday abroad. Travellers with the condition may wish to consider taking out travel insurance for cancer patients before embarking on their journey. It is hoped though, that the blood test will allow women to take action that stops the cancer developing, including options less drastic than the double mastectomy. Doctors might be able to suggest lifestyle changes that can help reduce the chances of getting breast cancer, or recommend risk-reducing drugs. The researchers' findings are published in the online journal Genome Medicine.